When Dad told us we were going for a boat ride, I thought, "yah right." Last time he said that we were looking at cruise ships for an hour. This time though we actually did set sail - on a False Creek Ferry. At first I thought, "oh great, we get to ride on these putt putts." But you know what, those little electric and diesel powered boats are a lot of fun, plus they save you having to walk. We went all the way from Science World to Granville Island. It was neat riding the waves in False Creek (not really, the water's pretty tame - except when you get stuck in the wake of some big boat). We did see some dragon boats, lots of moored yachts, and the cityscape is awesome. But you don't have to stop there. If you want, you can buy an adventure pass and explore every nook and cranny of False Creek for an entire day. You could conceivably visit the Maritime Museum; hop on the boat and explore Sunset Beach (or swim at the Aquatic Centre); hop on the boat again and grab a bite to eat a Granville Island (don't miss the Coffee Roaster at Granville Island - my mom swears by it); hop back on the boat for more shopping at Yaletown (some people never have enough); jump on the boat for the last leg of your journey back to Science World. Of course, you could do the reverse too, if you wanted everyone fresh for Science World. What a great way to spend a day and tire everybody out (a bonus for many parents - especially those with little kids). On our ferry boat we had people of all ages riding. I got a kick out of the elderly woman who didn't need any help - even though two people offered it. Then there was the little baby who decided he didn't like ferry boats and cried the whole way. I bet that Mom was glad to get back on land. An all-day adventure pass costs about the same money as 2 movie tickets: $12 for adults, $10 for seniors, and $8 for children, babies ride free. Or you can do what we did and just take one ride, which cost Dad a lot less. You should check the links below to see if the rates have change at all, because sometimes they do. For people who can't afford their own boat (like us) the False Creek ferries are a neat way of sight-seeing without breaking the bank or having to wait 2 hours to catch a big ferry. Our relatives from Holland are coming next year and we're going to buy adventure passes to show them around. If you're like my Dad, you don't want to get on the ferry boat if there are a bunch of big boats powering around. He gets a little seasick and could lose his lunch if the waves are too high. The skipper assured Dad they'd never sunk a ship yet, or lost a man overboard. Dad was still the first one to get off when we docked. You can start your day of adventure at any of the False Creek Ferry stops: Aquatic Centre, Maritime Museum, Granville Island, Stamps Landing, Yaletown, and Science World. The passes enable you to ride the ferry on any run you want and, as many times as you want for a day. The adventure pass also gives you discounts on nearby attractions like the Granville Island Brewery tour, and the Maritime Museum. 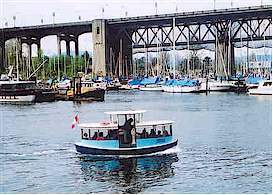 There are actually two ferry companies operating on False Creek: Aquabus Ferries (http://theaquabus.com) and Granville Island Ferries (http://www.granvilleislandferries.bc.ca). Please check out each web site for routes and exact fares. About 100 years ago, False Creek was about about five times the size it is today, and extended all the way up to Clark Drive. This is one activity I know most grown-ups will like. Even if you're not crazy about climbing in and out of a small ferry boat, you gotta like the attractions and scenery around False Creek.